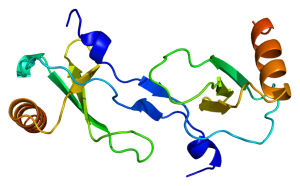 CCL2 (Chemokine C-C Motif Ligand 2), also known as monocyte chemoattractant protein 1 (MCP1) or small inducible cytokine A2 (SCYA2), is a protein classified as a chemotactic cytokine or chemokine. CCL2 binds to the chemokine receptors CCR2 and CCR5. CCL2 belongs to the CC chemokine family, small soluble proteins whose main function is to regulate cell trafficking and that act as molecular signals to induce cellular migration during inflammation. Chemokines are secreted in response to signals such as proinflammatory cytokines and induce chemotaxis through the activation of G-protein-coupled receptors (GPCRs), which involves adhesion molecules and glycosaminoglycans. CCL2 is produced by a lot of cell types (endothelial, fibroblasts, epithelial, smooth muscle, monocytic, and microglial cells which are important for antiviral immune responses and in tissue), often after induction by oxidative stress, cytokines or growth factors. Unlike other chemokines such as RANTES, CCL2 exhibits a chemotactic activity only for monocytes, T-cells, basophils, NK cells and immature dendritic cells. CCL2 doesn’t attract and activate neutrophils or eosinophils. But like RANTES, CCL2 has the ability to target memory T-cells, which is not the case with other chemokines.